“The Convergence of the Twain” was published in 1915. Hardy was commissioned to write a poem to be read aloud at a charity concert in aid of the charity disaster fund of the Titanic. The main themes include the huge power that Nature still has over even the most powerful humans (as it managed to sink the ‘unsinkable’ ship) and how the disaster rendered all the riches of the ship null. The poem puts great emphasis on the role that Fate had to play in the sinking of the Titanic. It is referred to twice with different names: the ‘Imminent Will’ and the ‘Spinner of the Years’. One of the main themes is the Fate that seems to be involved. In the sixth stanza Hardy mentions the ‘Immanent Will’ that ‘urges everything’ and how the meeting of the Titanic and the Iceberg was planned out by the ‘Spinner of the Years.’ The ‘Immanent Will’ prepares a ‘mate’ for the Titanic and makes is grow at the same rate as the ship. The internal rhyming in the eighth stanza of ‘grew’ and ‘too’ makes the rhythm repetitive and makes the reader picture the different stages of the construction of the Titanic being completed section by section. As the internal rhyme refers to the iceberg the rhyming also shows that Fate’s building of the Iceberg was of a similar, structured method and thus was the work of an organised, sentient being. The clash of the Titanic and the Iceberg is portrayed as an arranged marriage. Both the ship and the Iceberg are constructed by their makers and prepared for their imminent ‘consummation’ – a word with connotations of a marriage – and forced together. The contact between them is described as an ‘intimate welding’ which has connotations of a loving, inseparable relationship. The word ‘intimate’ shows the loving relationship and the description of their connection as ‘welding’ has connotations of forcefulness, and an unbreakable bond. Another key theme is that the ‘vaingloriousness’ of the rich is now being crawled over by the likes of the ‘grotesque’ sea-worm. The disgust the reader should show for the sea-worm is emphasised by the use of consonant-heavy words: ‘Grotesque, slimed, dumb, indifferent.’ The consonants slow the reader down and illustrate the crawling pace of the sea-worm over the mirrors. The commas also create 3 small caesuras which slow the reading down further which draws attention to the words and shows the sluggish movement of the sea-worm even more effectively. The fourth stanza describes the jewels designed to ‘ravish the sensuous mind’ and how they now lie ‘bleared and black and blind.’ The plosive ‘b’s draw the reader’s attention to the words describing how the jewels have lost their shine. The blindness of the jewels could be a reference back to the sea-worm that is ‘indifferent’ to the world around it. The comparison could imply that the sparkling jewels are just becoming another ‘slimed’ part of life on the sea-bed. 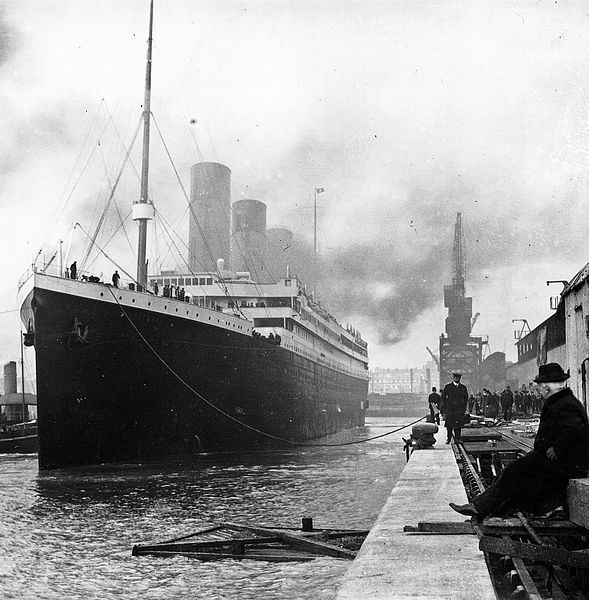 The second line of the poem, however, says that it is not necessarily a bad thing that the riches of the Titanic are at the bottom of the sea because they are ‘deep from human vanity.’ It was ‘human vanity’ that built the Titanic which sank on its first voyage so the ‘solitude of the sea’ could be a safer place than with humans and their vanity. The final main theme of the poem is that nature still has absolute power – even over vast riches. Hardy tells the story of the conflict between nature and culture and how nature won. The example of the Titanic versus the Iceberg is described at the end of the poem as the jarring of ‘two hemispheres.’ The Earth’s hemispheres are huge and the connotations of the word ‘hemispheres’ describes how magnificent the two objects were in size and, in the case of the ship, wealth. The Iceberg grows in ‘shadowy silent distance’ which contrasts the building of the Titanic enormously. The construction of the ship would have been very noisy, expensive and public and it is a sign of Nature’s power that the huge Iceberg grew so silently and in secret even though it was many times bigger than the Titanic. The main themes of The Convergence of the Twain are that the riches of humans are laid waste, that Nature still has total power and that Fate played a part in the meeting of the Iceberg and the Titanic. Hardy shows the themes in the poem by contrasting the opulence of the rich with the indifference and slime of a sea-worm. He shows Nature and Fate by making references to forces such as the ‘Imminent Will’ and the marriage of the ship and the Iceberg. If the poem is seen as a dramatic one, one interpretation could hold ‘The Spinner of Years’, fate, as the director of a play (in this case the story of the collision) in which he/she gives the order ‘ Now!’. This could establish the control fate is shown to have in this poem. Whoever created this website, I love you.